Scalloped bracing and premium electronics are chief among the premium offerings for these still-affordable guitars. “When we decided to renew the CSF line, we wanted to offer the quality of an upscale instrument in a portable package that’s affordable for professional and recreational players alike," said Dennis Webster, product marketing manager, Yamaha Guitars. 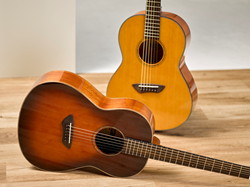 Today Yamaha reintroduced their classic CSF line of acoustic parlor guitars with upgrades in sound and construction typically seen in larger or premium guitars, yet still affordable and portable enough to suit both casual players and seasoned professionals. Coming 15 years after the original CSF series ended its run, the new CSF1 and CSF3 offer significant upgrades over their predecessors. Chief among them is the addition of scalloped bracing, a specialized latticework of reinforcements used in higher-end Yamaha guitars to improve tone and projection. The CSF1 has a solid Sitka spruce top mated to laminated mahogany back and sides, nato neck, blackwood fingerboard and bridge, abalone rosette, and the original Yamaha SRT Zero Impact passive pickup system. The premium CSF3 matches the features of the CSF1 and adds a solid mahogany back and sides and mahogany body binding. Both models come in a natural gloss finish. The 20-fret fingerboard sports a scale length of 600mm (23.7") to offer an easy playing platform without compromising the instrument's range. Each model comes with a new hard bag, making the CSF1 and CSF3 ready to go wherever the music takes you. "Whether you call them 'parlor,' 'travel' or 'mini' guitars, players recognize compact acoustic guitars as serious instruments," said Dennis Webster, product marketing manager, Yamaha Guitars. "When we decided to renew the CSF line, we wanted to offer the quality of an upscale instrument in a portable package that's affordable for professional and recreational players alike. Thanks to the scalloped bracing and onboard electronics, these guitars are as capable onstage as they are comfortable to carry around." The Yamaha CSF1 (MSRP: $645) and CSF3 (MSRP: $880) will ship in February 2018.